DragChamp.com teams up with racers for monthly blog series. 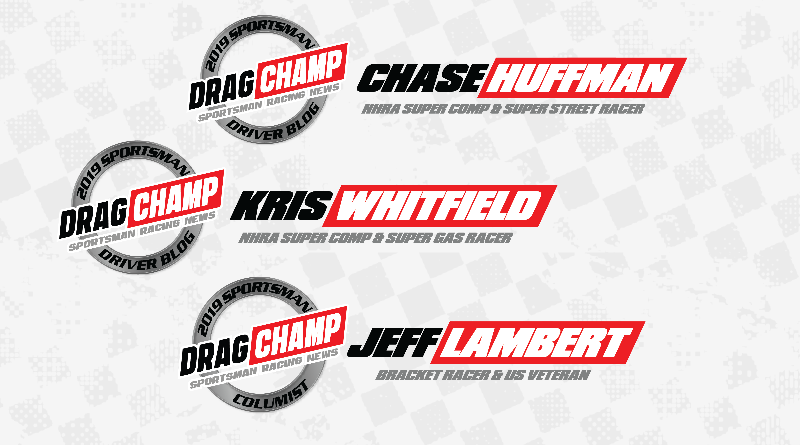 Team DragChamp expanded recently with the addition of Chase Huffman, Kris Whitfield, and Jeff Lambert. Each of these talented racers will share their racing adventures on DragChamp this season. Chase Huffman, Waxahachie, Texas, currently competes in his Chase-N-Dad Racing Super Comp dragster and Super Street Camaro. Having grown up around racing, Chase climbed into a junior dragster at the age of eight. At sixteen Chase moved into the big cars eventually winning the NHRA Fall Nationals in Dallas. On most weekends, you’ll find Chase at the track with family and friends. In 2019 you’ll find Chase at race tracks throughout Division 4. Kris Whitfield, Littleton, Colorado, currently competes in his Whitfield Family Racing Super Comp dragster and Super Gas ’27 Roadster. Kris, a two-time national event winner and 16-time track champion, began racing at the age of eight in a junior dragster. With a proven track record of success, Kris and his family travel the country competing in big money bracket races and NHRA events. Jeff Lambert, McConnells, South Carolina, is the President of Armed Forces Racing and the founder of racesponsorships.net. Jeff’s passion is to grow the sport of sportsman drag racing and help grass roots racers improve their race programs through sponsorship’s. In 2019 Jeff will share articles that will guide racers through obtaining sponsorship’s for their race team. Look for Chase, Kris, and Jeff at drag racing events in your area. Make sure you introduce yourself and let them know that you’re following them on DragChamp. Racer blogs will be released each month beginning February 2019. Click here for more information on Team DragChamp.